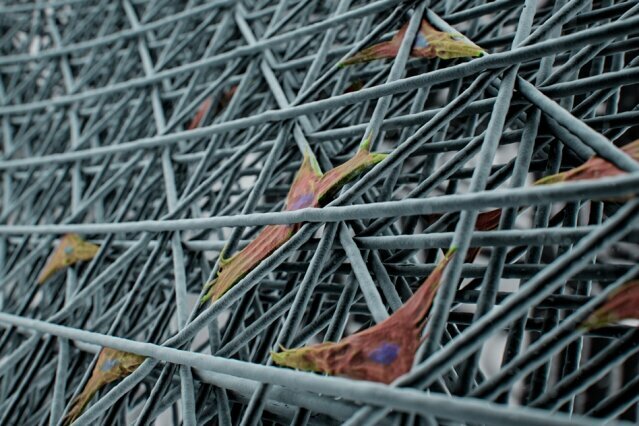 A new way of making scaffolding for biological cultures could make it possible to grow cells that are highly uniform in shape and size, and potentially with certain functions. The new approach uses an extremely fine-scale form of 3-D printing, using an electric field to draw fibers one-tenth the width of a human hair. The system was developed by Filippos Tourlomousis, a postdoc at MIT's Center for Bits and Atoms, and six others at MIT and the Stevens Institute of Technology in New Jersey. The work is being reported today in the journal Microsystems and Nanoengineering. Many functions of a cell can be influenced by its microenvironment, so a scaffold that allows precise control over that environment may open new possibilities for culturing cells with particular characteristics, for research or eventually even medical use. While ordinary 3-D printing produces filaments as fine as 150 microns (millionths of a meter), Tourlomousis says, it's possible to get fibers down to widths of 10 microns by adding a strong electric field between the nozzle extruding the fiber and the stage on which the structure is being printed. The technique is called melt electrowriting. "If you take cells and put them on a conventional 3-D-printed surface, it's like a 2-D surface to them," he explains, because the cells themselves are so much smaller. But in a mesh-like structure printed using the electrowriting method, the structure is at the same size scale as the cells themselves, and so their sizes and shapes and the way they form adhesions to the material can be controlled by adjusting the porous microarchitecture of the printed lattice structure. "By being able to print down to that scale, you produce a real 3-D environment for the cells," Tourlomousis says.